Provide a national best practice ‘toolkit’ to equip schools with the resources to tackle Homophobic, Biphobic and Transphobic bullying. It is unacceptable that homophobia in school environments is going dismissed. 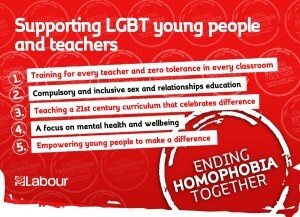 Homophobic bullying restricts learning and causes long term damage and hurt to too many young people today. It should never be ignored, and that’s why it is good to hear that my constituent is taking action to raise awareness of this very troubling problem.